Nine months after a major radio transmitter mast had to be pulled down, major work is to take place to rebuilt the mast. 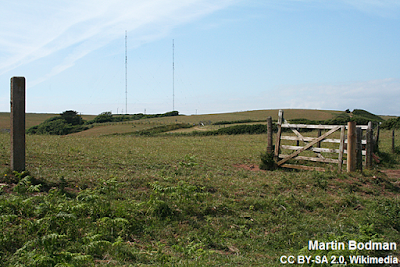 Engineers were rushed to the Start Point transmitter site in South Devon in January after one of the two masts started to bend following a breakage of one of the stay cables. The leaning mast was subsequently demolished and BBC Radio 5 Live, which broadcasts from the mast, was put on reduced power. Starting Monday 12th September, work to build a new mast and to refurbish the surviving mast will commence. Subject to weather conditions, the work is expected to be completed by mid-December. The work means that BBC Radio 5 Live on 693kHz will be on reduced power in Devon, with listeners being advised to seek alternative ways of listening, such as via DAB digital radio, or where possible on 909kHz Medium Wave. No other services are broadcast from the site, which was originally the home to important tests by BBC Engineers during the Second World War. The mast build and refurb comes at a time when the BBC's AM services may not have long to survive, with BBC unlikely to commit to continuing simulcasting its services on multiple wavebands and technologies. The mast site itself is now owned by Arqiva, who will have a current agreement with their customer, the BBC, to restore normal service, regardless of any future plans. The Start Point incident was the first major issue affecting a UK TV or radio transmitter mast since the collapse of the Peterborough FM mast in 2004.